The examples used in this tutorial were the actual flowers that I used in our wedding. These could be used for any special event including weddings, bridal showers, baby showers, homecoming, prom, etc. Having zero training or prior experience with flower arranging, the goal was to come up with a selection of bridal party flowers that were quick and easy to make. Doing your own flowers for your wedding or any special event can save hundreds, even thousands of dollars. When time is of the essence, the key is good preparation. You will want to order and pickup the flowers early enough in advance that it won’t interfere with any other planning activities, but late enough that the flowers will be in full bloom and not wilting. It’s not always an easy task. The first thing that you will need to consider is where these flowers will come from. For our wedding, we were lucky enough to live within an hour of a wholesale florist. As long as the purchaser has a business license (not necessarily a florist business license), then the wholesaler would sell the flowers at the discounted cost. This is by far the cheapest way to obtain large quantities of flowers because you are able to purchase the flowers at the same cost that a florist would. If this option is not available, you will need to shop around and find the best price for flowers. Some options to consider include your local grocers (Publix, Winn-Dixie, etc. ), private florists (which is usually higher, but may have a better selection of available flowers), or wholesale stores (such as Costco or Sam’s Club – if they have a floral department). Next you will need to decide on a color scheme. Once you decide on the colors that you are using, you will be able to determine what flowers are available in that color scheme during the time of year that you will need them. This means that if you want peonies in late September in lower Alabama, you are either not going to get them or will have to be an exorbitantly high price for them. Sadly, this is a true story. Finally, you will need a game plan for planning, pickup, storage, creation, and delivery. Knowing that I needed at least 1 full day plus part of another day to finish all of the floral arrangements meant that the flowers needed to be picked up on Thursday. To make sure that the flowers don’t wilt before the big event, you will need to have some kind of adequate storage (your refrigerator will not be big enough – not even close). The floral wholesaler recommended keeping the flowers in a room at 55F. This is very important. After the flower’s are arranged, you will also need to decide how they are going to be transported to whatever facility you are using. If you are able to make all of the flower arrangements at the facility, then you are in good shape because this can be another headache if anything falls over or gets too heated. We were lucky to get into the facility one day early, but it was not enough time to finish all of the flowers so we had to work out a transportation plan and although the flowers survived, it wasn’t pretty. For our wedding, our color scheme was simple – white and ivory. Luckily, there are many flowers that work with this color scheme so we just needed to decide what would be the most feasible. The flowers we decided on were hydrangeas, baby’s breath, traditional roses, garden roses (in place of the peonies), and stock. By using different combinations of the flowers above, we were able to create the bridal bouquet, bridesmaid’s bouquets, flower girl bouquets (in lieu of petals), groom’s boutonniere, groomsmen boutonniere’s, mother’s corsage, centerpiece arrangements, cake topper, church centerpieces, and aisle markers. 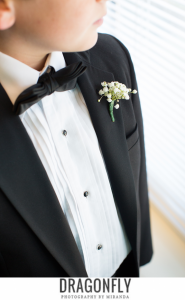 In this tutorial we will examine how to make a simple baby’s breath boutonniere, which makes for a perfect groomsmen boutonniere, and one alternative, which was used as our groom’s boutonniere. The key to a successful boutonniere is making sure it can be easily secured and will lay flat. Baby’s breath is a perfect flower for the job. If you are looking for something more masculine or perhaps for a country/barn wedding, cotton makes for a creative alternative as well. Taking a small piece of baby’s breath, cut off the stem leaving about 3 inches of white flowers. Using the floral tape (I prefer the green kind), begin wrapping the stem. It should be approximately 1.5 inches in length. Wrap the stem several times to ensure that the boutonniere pins will be able to easily pierce it and still hold together. There you have it. Your first boutonniere. Add 2 boutonniere pins to the back and you are done. Pretty easy, huh? Luckily, these only take about 5 minutes or less to do so times that by the number you need and you will have a good timeframe for how long this process will take. One of the best things about baby’s breath is that it will hold its color for several days. We made all of the groomsmen boutonniere’s on Thursday evening (with the wedding planned for Saturday evening), placed the boutonniere’s in a small container in the fridge, and they held up beautifully for the big day. 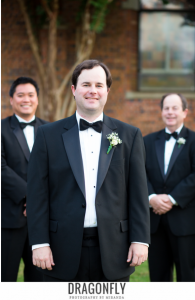 It is common for the groom’s boutonniere to stand out from the groomsmen’s. My initial thought was to just use two leaves and one traditional rose for the boutonniere, but the roses were so large that it didn’t look very attractive and was difficult to lay flat. Back to the baby’s breath. Using the same method as with the boutonniere’s above, take a more generous portion of baby’s breath (about 2-3 stems) and one stem of stock. If you are not familiar with the flower stock, it is a delicate flower with small ruffled flowers and a light perfume fragrance. Using the baby’s breath as the back of the boutonniere, lay the baby’s breath pieces flat and place the stock slightly below it. As with the groomsmen’s boutonniere’s this should be approximately 3 inches tall. Take the floral tape and generously wrap the bottom portion of the boutonniere. The stem of the stock is much thicker than the baby’s breath stems so it is important that this is thick and tightly wound. 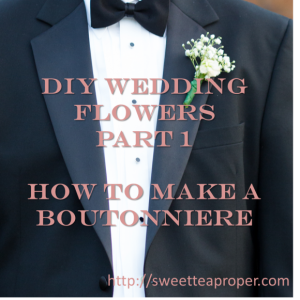 Place 2 boutonniere pins in the back of the floral tape and put the finished boutonniere in a small cup of water inside the refrigerator or cooler. Unlike the boutonniere’s made solely of baby’s breath, the stock will require water to keep its color before the event. Check back soon for additional tutorials including how to make a bridal bouquet, bridesmaid’s bouquets, flower girl bouquets, aisle markers, and wedding reception centerpieces.